Our plan for Saturday was to attend the son of our friends graduation party for a while and then head to the lake. We were going to meet Dave and Heather and his Dad and Mom for some boating and then wanted to share dinner on the grill. Unfortunatly, mother nature decided Minnesota needed more rain! Time for our backup plan. After a quick call to Heather as it poured outside we decided to meet at their house and make home made pizzas. But before we could get to their house we had another set back. As the rain was coming down very heavy, I noticed little balls of hail on the windshield and since hail and cars are not a good mix. I turned on the next street and tried to find a tree to park under. By this time the hail was becoming larger and it was about the size of peas. Fortunately there were a couple of trees that were slightly hovering over the street so I pulled up and parked our car under them. 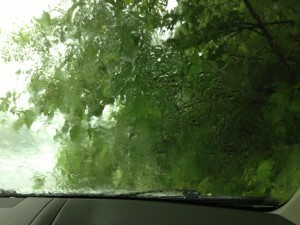 I could only get 2/3 of the car under the branches and hoped that would do the trick. We remained under the tree for ten minutes or so while the rain and hailed continued before we started leaving; then the hail returned again and we ended up back under the same tree again! Hard to see the hail but it was coming down. Once the hail finally stopped and the rain had lighted up significantly I made the executive decision to head for home and wait for the storms to blow by before joining the others. As all of this is going on Chris is taking pictures and posting them on Facebook. The interesting thing about this storm was it was pretty isolated and most of our friends told us they didn’t see a drop of rain. After the brief stop at the house we ventured over to Dave and Heathers house where she was prepping the vegetables and other ingredients for the pizzas. Dave had been out running errands and and arrived shortly after us. It was nice reminiscing since it had been a couple weeks. Then it was time to share a glass of wine! While we had been waiting at house for the storms to pass I had pulled the cork on a nice Rose’. It was to be enjoyed on that boat ride, but “oh well”. The Rouge had a nice garnet hue and medium color depth in the glass while there was no sediment in our glasses. Very aromatic and young. We could smell cherry, chocolate, and spice. The Rouge was slightly sweet and dry and it was medium bodied with nice acidity. The tannins were week and soft. We could taste plum, cherry, and vanilla. To our surprise the Rouge blend was very flavorful with a medium finish. How much: Dave said he bought a four pack from one of the online retailers as I mentioned above at around $19 per bottle. I think he was wrong because I looked online and it was around $15 per bottle for the 2010. 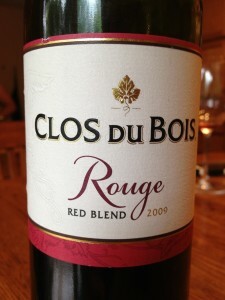 Regardless, if you enjoy blends the 2009 Clos du Bois Rouge Red Blend at $15 per bottle is a great buy! 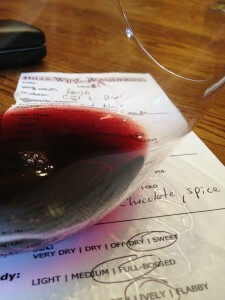 I rated the 2009 Clos du Bois Rouge Red Blend three glasses because it is a tasty value wine.